welcome to our green schools corner! 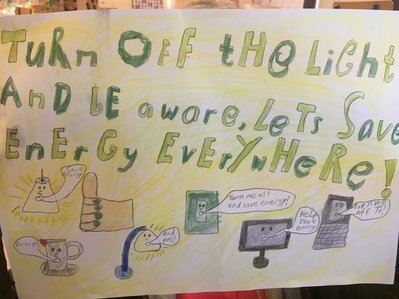 ​"Turn off the lights and be aware...let's save energy everywhere!!" 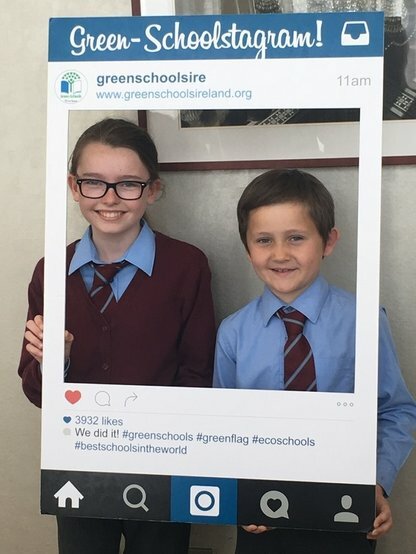 St. Nicholas' Primary School proudly received their second Green Flag for energy conservation at an awards ceremony in City North Hotel in Gormanstown on Thurday 25th May. ​We left school at 11.30 with Ms. Duignan and Ms. Gouldsbury to go to City North Hotel. We felt very happy and excited to be representing our school. When we got there, we got some goody bags with a badge and pencil case inside. We got our photographs taken, even one with a giant lobster! We wrote down a wish to hang on the Green Wishing Tree. We wished that pollution would stop, a healthier environment and we also wished to get all the Green Flags! There were lots of other school from Meath and some from Cavan there too. After that, we had a delicious dinner. Brooklyn had pasta bolognese and Carly had an amazing chicken curry. We even had dessert! ​All the schools were then called into a big room and presented with their Green Flags. Some schools were getting their first flag for Litter and Waste and others were getting flags for Water, Travel, Biodiversity and more. There were lots of speeches and we watched videos showing us how well all the schools over Ireland were doing. We felt so proud collecting our second flag and certificate. We chatted happily all the way home from the ceremony. Thanks to all students and staff that helped us in achieving our second Green Flag.